Government and the 2010 World Cup Organising Committee started the Football Friday campaign in September last year to build up excitement leading to the World Cup. with every Friday bringing about a display of colours as South Africans sport football jerseys, T-shirts, caps and flags. If you haven't joined in yet, get into the spirit of the beautiful game by showing your true colours as a supporter of South African football. 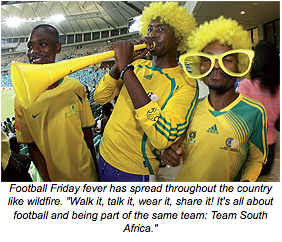 Wear a football jersey every Friday, especially the colours of our national team, Bafana Bafana. Companies, businesses, schools and community organisations have encouraged their employees and supporters to join in the Football Friday fun. You can also encourage your friends, families and communities to get involved in spreading the Football Friday message. By wearing your country's football kit or colours, you show the world that as the host country we are proud of our team and our country. Apart from wearing our country's football colours on Fridays, South Africans are also encouraged to fly our beautiful flag whenever and wherever they can. Thousands of hand-held flags are being handed out to communities across the country during road shows organised by government. 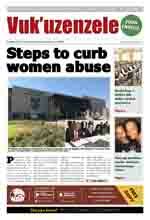 This enables South Africans to fly and display the country's flag proudly ahead of the World Cup. Many businesses across the country are taking the campaign a step further and are decorating their offices and buildings with the South African flag. 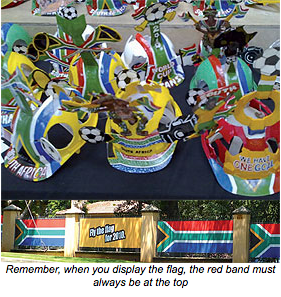 Some companies are displaying massive South African flags and are challenging others to follow their example. People are also displaying the flag on their car doors or flying it from their aerials. All this enthusiasm has taken the Fly the Flag campaign to new heights, showing the world we are united in our commitment to host an unforgettable World Cup. Show your commitment and be a proudly South African 2010 ambassador. Spread the word of Football Friday and fly the flag with pride. Every South African can show the world what ubuntu really means by being a 2010 World Cup ambassador. Be a good host and be friendly and helpful to all visitors. Explain local words to visitors and help them when they are lost. If you're not a soccer fan yet, get excited by following international and local football games. Watch the games with friends and family. It's a fun way of getting to know the sport, as well as firing up some excitement for the World Cup.